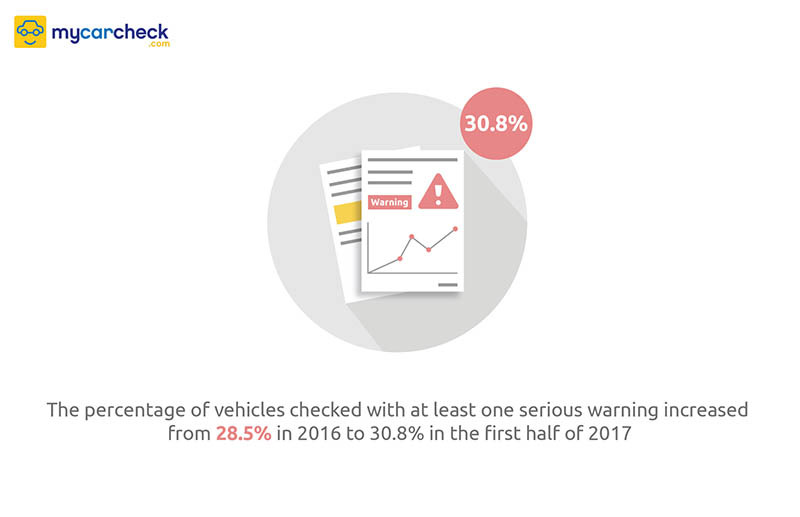 New data from used vehicle checker mycarcheck.com has revealed that serious warnings (including write-off, finance and stolen) have risen again, to 30.8% of all checks in the UK in the first six months of 2017. This follows an increase from 25.6% in 2015 to 28.5% in 2016. The Citroën C1 VTR was the highest risk of mycarcheck’s 100 most-searched models for write-off, the Corsa SXi AC for finance and the Ford Fiesta Titanium for stolen. CDL Vehicle Information Services is a member of the British Vehicle Rental and Leasing Association (BVRLA), the Consumer Credit Trade Association (CCTA), the Finance and Leasing Association (FLA), the Motor Asset Registration Service (MARS), the National Association of Motor Auctions (NAMA) and the Vehicle Remarketing Association (VRA).